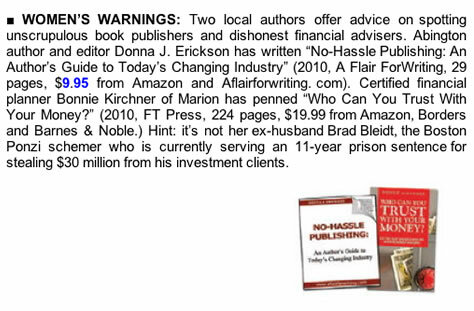 Founder Donna Erickson's was invited to cosponsor a global teleseminar of authors (500+ signed up for it) by national P/R expert, Annie Jennings. When I wrote my book A Terrible Beauty I felt that I had a winner. Then after a few neutral friends read my manuscript, and raved about the book, I really felt encouraged. However my experience in searching for an agent and publisher was very disappointing. Almost all of them rejected my work without reviewing it. It seemed as if there was some kind of “cult” belief that first-time writers didn’t get a chance. I also felt that many agents particularly enjoyed the rejection process. Then you entered the picture. You took the time to see the message of my book. You also took the special effort to match me with the perfect editor, Lenny Cavallaro. Wow, did Lenny prove to be a hard taskmaster as he made me dig deeper into myself to express more forcefully the emotional messages of the book. So I am deeply appreciative of A Flair for Writing and what you have done for my book. Thank you eternally.